Participate in the 1000 Lights Water Lantern Festival happening at The Market Common Saturday at 5:30 PM. See Edwin McCain perform live at Banditos Cantina on the Myrtle Beach Boulevard Friday (tonight) starting at 9PM. Sing “Happy Together” with The Midtown Men from Jersey Boys at the Alabama Theatre on Saturday night at 7PM. Be sure to book reservation online prior to event! Bring the kiddos along and visit Ripley’s Aquarium Sensory Friendly event located at Broadway at the Beach all day Saturday. Taste a sweet & savory southern style brunch with Rory John Zak at Tin Roof on Sunday at 12PM. Explore the art culture happening around the Grand Strand at the Spring Art in Common Arts & Crafts Show in Valor Park at The Market Common happening Saturday and Sunday. Hop on over to the Barefoot Bunny Hop at Barefoot Landing on Saturday from 11AM – 1 PM! Tee up (or should we say putt up!) at Marshwalk Masters Tournament on the Marshwalk in Murrells Inlet on Sunday starting at 3PM. Jam out with Chase Rice, America’s famous country singer at The House of Blues Saturday night! Doors open at 7PM. We hope you enjoy your Myrtle Beach vacation rental and stay. Have a fantastic weekend from Palmetto Vacation Rentals! The Simpsons have come to real life! Welcome to the first ever created “Kwik-E-Mart,” a popular and new convenience store seen on The Simpsons show to hit the Grand Strand last August. Located right at Myrtle Beach’s popular tourist attraction, Broadway at the Beach, Kwik-E-Mart has attracted Simpson fans from all around the country wanting a taste of the famous Lard Lad Donuts and Heat-Lamp Hot Dogs. This is the first ever Kwik-E-Mart to open! The popular convenience store has hinted that this is the first of many to open around the United States in the coming years. After opening last August, Kwik-E-Mart has become an iconic place for every Simpson fan wanting to slurp the famous Squishee Slushies and purchase Simpson memorabilia. There is also many delicious Simpson inspired treats and unique sitcom souvenirs all around the Kwik-E-Mart too. 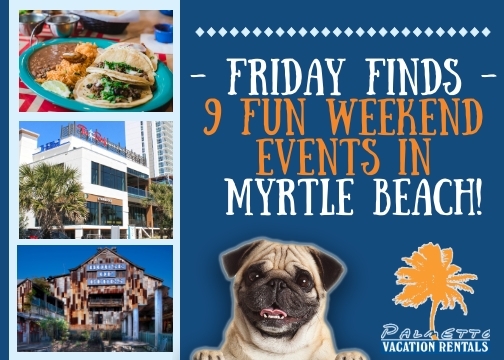 What more could you ask for on your next Myrtle Beach vacation? There is also The Aztec Theatre, a unique 4-D Simpsons movie experience that is set to open in the next few months. The theatre is conveniently located next door to the Kwik-E-Mart-perfect to gather up some snacks before entering! To follow news regarding the opening of the theatre, be sure to sign up for their updates on the website link below. On your next Myrtle Beach vacation, be sure to step on into the land where Homer, Marge, Bart, Lisa, and Maggie rule and donuts are the key to happy living.